Whatever your taste, pour a glass neat, on the rocks, a Manhattan, a Mint Julep or your drink of choice and raise a glass to the best whiskey in the world – bourbon! “Virgil Caine is the name, and I served on the Danville train…” So begins one of the most legendary songs in the rock lexicon, “The Night They Drove Old Dixie Down.” The song tells the story of the surrender of the Confederacy from the viewpoint of a southerner. Written by The Band, released in 1969 and sung by Levon Helm, the American, southern drummer and singer in a band of Canadians who understood Americana as good as anyone. This week is the fourth anniversary of Helm’s passing, so let’s raise today’s glass to him. The fact it’s named Virgil Kaine makes it all the more appropriate. Virgil Kaine (with a “K”) is also the name of a whiskey maker from South Carolina. Founded by two acclaimed chefs, the idea was to take the concepts of molecular gastronomy and apply it to whiskey making. While there are many examples of this today – Jefferson’s Chef Collaboration, for instance – the idea was more novel in 2011 when David Szlam and Ryan Meany decided to take a love of whiskey and culinary experimentation and start the company. Their most recognizable product is the Bourbon and Ginger. The process is unique: they start with a young sourced bourbon, heavy in rye (60-36-4 corn/rye/barley) and then infuse locally grown yellow hawaiian ginger. Different sources mention the addition of other ingredients, including (potentially) cinnamon and vanilla. After maceration, the bourbon is distilled a second time for refinement before being bottled and sold. But how does it taste? The nose is a cool customer. There is obviously ginger, but not nearly as strong as I expected. Similarly, there is light cinnamon, vanilla and a touch of baking spice. What there isn’t is oak or strong bourbon presence. The fact this is a young pour shows in the nose. Still, it is a pleasant softness, that slightly reminded me of a glass of Vernors. Jen pointed out the same thing. When we added soda water, it deadened the flavor too much. The best way to enjoy it was neat or with a few rocks. Straight, it drinks like a nice – albeit potent – cocktail. If you like your whiskey with a touch of ginger, you cannot go wrong with this one. This product does not seem to be available in Michigan, or many northern or western states yet. I grabbed my bottles while in Atlanta and Asheville a few weeks back. Hopefully, distribution will expand further as well. It’s a fun addition to the liquor cabinet. Today, we drink bourbon in celebration of the victors of Super Bowl 50. Just like the Broncos that vanquished the Carolina Panthers last weekend, our spirit of choice hails from Denver, Colorado. The Laws Whiskey House in Denver, Colorado takes great pride in their trade as craft distillers. The whiskies they produce are distilled from (mostly) local grains: the corn is from Wisconsin, but the barley, rye and wheat come from Colorado. Laws Whiskey distills the juice and ages it themselves, before bottling and selling. 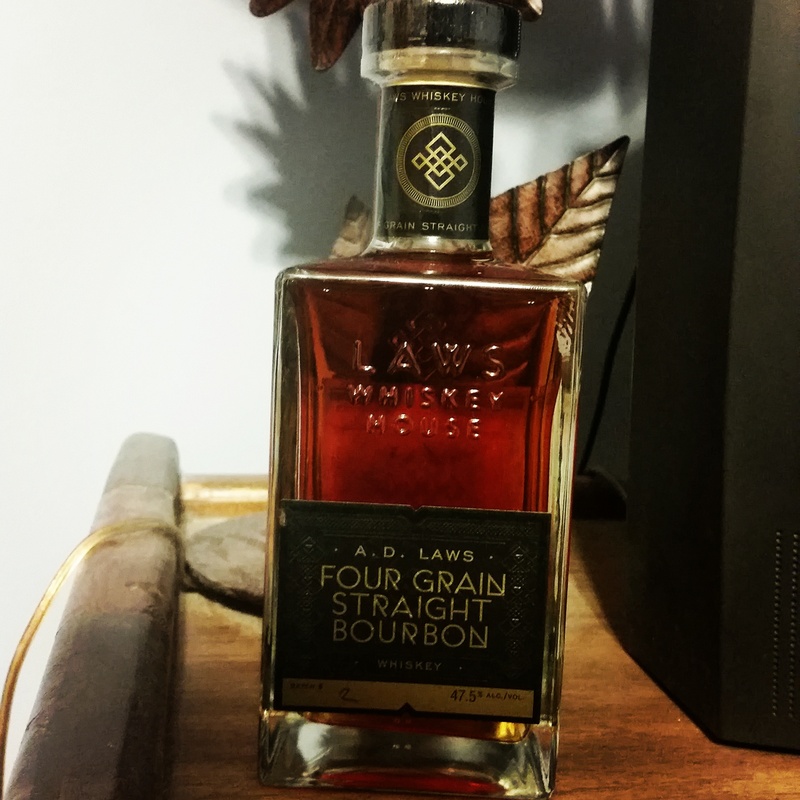 The Laws distillery makes traditional straight bourbon, but for today’s taste, it’s the unique A.D. Laws Four Grain Straight Bourbon we’re trying. Now, bourbon by it’s legal description has to be made of at least 50% corn. What makes up the other (up to) 50% is usually distillers choice. Barley usually makes up a small percentage, with the rest being either a rye (spicier) or wheat (smoother). Making a whiskey utilizing all four grains can be extremely tricky, as it involves balancing many flavors. Hence, there are very few four grain bourbons on the market. It would make sense, however, that a craft distillery, with very good control on the source products they use, like Laws Distillery would be perfect to try this. The Laws website is full of focus on the craftsmanship and patience employed. Now their AD Laws Four Grain Bourbon is available throughout the country. So how does it rate? On first nose, I was surprised at the lack of sweetness. There was an oak and leather, and a tinge of tobacco. I also pulled a lot of baking spices that caught me off guard. The Four Grain Bourbon is three years old, so I expected the sweetness of corn, but even after sitting out for a bit, the smell was allspice and oak, with a slight hint of dried raisin. The Colorado distiller boasts that their whiskey ages year round, unlike Kentucky whiskey which ‘sleeps’ in the cold winter. The fluctuations in Colorado mile high air supposedly keeps the whiskey maturing year round. I admit I was sceptical, but the nose certainly didn’t seem like such a young whiskey. The taste was surprisingly mature too although not as tannic as the nose hinted at. The leather and oak were most prominent, with a subtle tickle of spice, more clove than pepper. But there was some sweetness now, albeit as a secondary flavor, with a hint of vanilla and the slightest bit of honey. The mouth feel was medium – neither watery or creamy – and the youth of the drink showed through more in the second half, and subsequent drinks. An ice cube opened up the flavor a bit, leaning toward the savory and added a bit of pepper. It did taste young, like the individual elements weren’t fully absorbed, but it did taste like it was quality made. The finish was medium, and had a bit of harshness to it. Overall, its a unique and quality product by a craft spirit house that obviously cares about their product. It is also refreshing to drink spirits that are more about the product and less about the story. That said, this wouldn’t be a daily drinker for me – a bit too bitter, and a bit too young. But kudos to Laws Distillery for their dedication to fine craftsmanship, and daring. 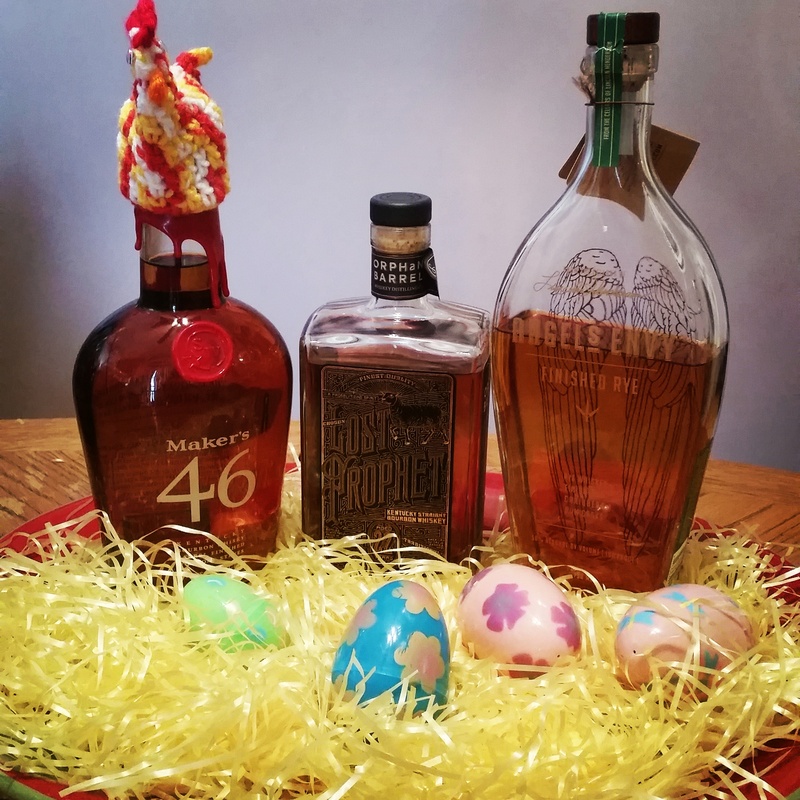 Happy Easter and Opening Day from BaseballAndBourbon.com! 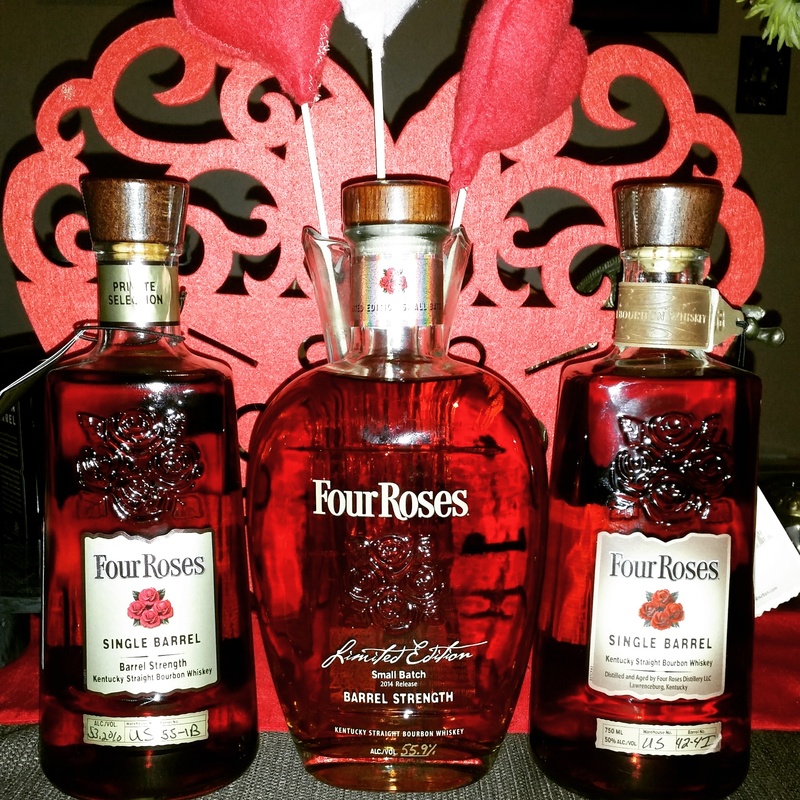 Three bottles of Four Roses counts as a dozen roses, right? Happy Valentine’s Day from Baseball and Bourbon!